Abstract: Reimagining energy education involves moving beyond the basics of energy use, conservation, and efficiency toward a more robust exploration of energy. This exploration should address energy access and equity, the impacts of energy choices, and personal attitudes, beliefs, and behaviors related to sustainable energy solutions. One approach to encourage this evolution is to use a learning context that inspires educators and students to delve deeply and methodically into the social, economic, and environmental interconnections of energy issues—in other words, to learn about energy within the context of global sustainability. In this article, we share Facing the Future’s definition of global sustainability education (GSE), explain why GSE is an effective context for energy education, and use Facing the Future’s newest energy curriculum to demonstrate how GSE can be employed to develop engaging and rigorous interdisciplinary energy curriculum. How is an individual’s energy use a global issue? Can you think of a situation in which reducing energy use would lead to an increased quality of life? How does energy use vary around the world? 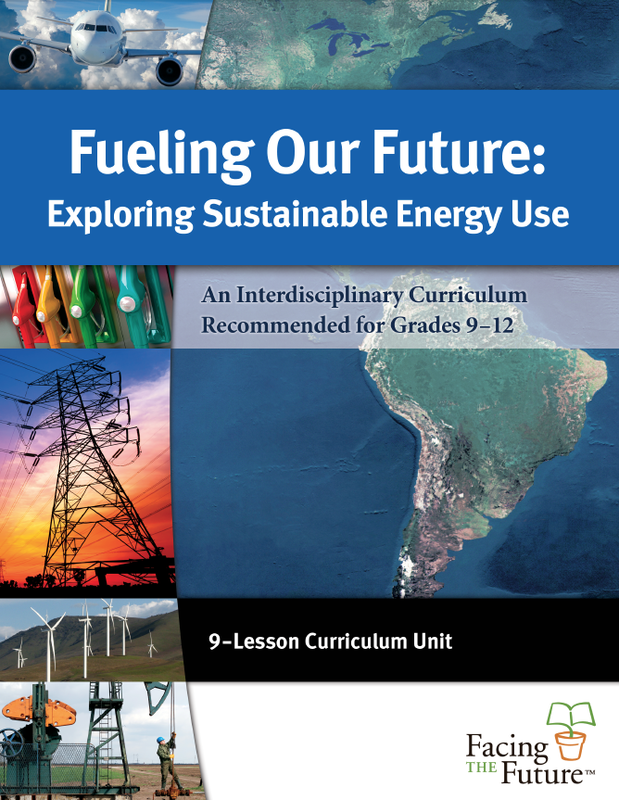 The questions above are ones that teachers and students wrestle with in Facing the Future’s (FTF) newest middle and high school curriculum units, Fueling Our Future: Exploring Sustainable Energy Use. These units were written through the lens of global sustainability and invite students into an authentic exploration of human energy use. For twenty years, FTF has utilized global issues and sustainability as a framework to develop resources for educators around the world that equip and motivate students to develop critical thinking skills, build global awareness, and engage in positive solutions for a sustainable future. Our experience working with educators around the nation and across the globe suggests that the context for education matters. While using FTF’s curriculum, 86% of educators reported that their students are more engaged and 91% of educators reported an increase in their students’ critical thinking skills. Of these educators, 93% reported an increase in their own knowledge of global issues. In this article, we share FTF’s definition of global sustainability education (GSE), explain why GSE is an effective context for energy education, and use Fueling Our Future as a case study for how GSE can be employed to develop engaging and rigorous interdisciplinary curriculum. What is global sustainability education? Global sustainability education (GSE) describes the concurrent and intentional use of both global issues—issues that are transboundary, interconnected, and persist over time —and sustainability to frame and design curriculum. At FTF, sustainability is defined as the principle of meeting current needs without limiting the ability of future generations to meet their needs. Sustainability recognizes that the social, economic, and environmental concerns of a particular issue are interdependent and that there is an intergenerational responsibility to balance these 3 components today and in the future. GSE purposefully references global to require the inclusion of diverse cultural perspectives, world data, and case studies from around the globe to help students broaden and deepen their global perspective. GSE also intentionally uses inquiry-based and student-centered pedagogies that encourage critical and systems thinking, individual and collaborative learning, role playing, and positive action in order to help students acquire the knowledge, skills, and attitudes that empower them to contribute to a sustainable future. While FTF’s educational approach is unique, we have not been alone in our desire to integrate sustainability and education. Global summits in the 1990s focused the world’s attention on issues of equity and human rights in economic aid and development, demanding a more critical examination of the full impacts of globalization. Principles of sustainable development emerged from various international efforts, such as the 1991 Earth Summit’s Agenda 21, the 1995 Beijing Declaration from the 4th World Conference on Women, and the United Nations Educational, Scientific, and Cultural Organization’s (UNESCO) ratification of the Earth Charter in 2000. In 2005, the United Nations declared the Decade for Education for Sustainable Development as a means to renew education, teaching, and learning and promote the values and principles of sustainable development. To continue these ongoing efforts, the Sustainable Development Goals will serve as the United Nations’ post-2015 development agenda. Today, the integration of sustainability and education is also growing among K-12 educators, schools, districts, and states, as evidenced in national programs such as the U.S. Department of Education’s Green Ribbon Schools program and the inclusion of sustainability in standards such as the Next Generation Science Standards. Why is global sustainability an authentic context for energy education? If our desired outcome for energy education is energy literacy, then content knowledge is not enough. Affect and behavior also must be addressed in order to promote energy literacy. This concept is supported by the experts who created Energy Literacy: Essential Principles and Fundamental Concepts for Energy Education. According to this framework, an energy literate citizen will understand “the nature and role of energy in the universe and in our lives” and will be able to “apply this understanding to answer questions and solve problems.” This framework clearly states that fostering energy literacy requires an interdisciplinary approach to energy education and the principles and concepts included in this framework explicitly address the social, environmental, and economic components of human energy use. Effective energy education programs are in clear alignment with the goals and approach of global sustainability education. Lessons and curricula designed using global sustainability as a context are interdisciplinary and examine real-world issues from social, environmental, and economic perspectives. With GSE’s student-centered approach, students learn much more than energy facts; they are empowered with the knowledge, skills, and dispositions necessary to be active, global citizens. How can global sustainability be used as a framework to develop curriculum? Figure 1: Global sustainability was used as the guiding framework for this 9-lesson, interdisciplinary energy curriculum. year project, funded by the United States Department of Agriculture-National Institute of Food and Agriculture (USDA-NIFA), explores the possibilities of creating jet biofuel from Pacific Northwest forest residuals in order to provide an alternative to petroleum-based jet fuel and petroleum-based products. If the total amount of energy in the world never changes, what do people really mean when they talk about “saving energy” by driving less or turning off lights? 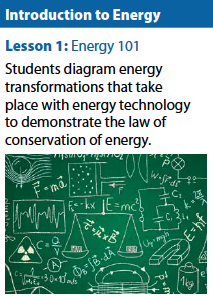 Figure 2: Lesson 1 focuses on students’ prior knowledge about energy and the physical laws of energy. Fueling Our Future begins with an individual and collective brainstorm of the different ways humans consume energy. This allows students to begin their energy exploration from personal experience and provides teachers with information about students’ prior energy knowledge. The lesson then focuses in on some foundational energy science—the physical laws of energy—so students can use this content knowledge in subsequent lessons. Juxtaposing a conversation about human energy use with the physical laws of energy provides teachers and students an opportunity to explicitly address misunderstandings that often arise from inaccurate references to energy in everyday vernacular and from a single discipline approach to energy education. For instance, students might learn in a science classroom that energy is neither created nor destroyed, while they might hear in a social studies classroom that natural resources are used to “produce” or “create” electricity. With this silo approach, students may never get the opportunity to reconcile these seemingly contradictory lessons about energy. However, with an interdisciplinary approach to energy education, these different perspectives of energy can be included and lead to a more comprehensive understanding of energy concepts. Besides choosing sustainable energy sources to produce electricity, what are some other ways that individuals and communities can lessen some of the negative impacts of generating electricity? Figure 3: By making energy production more relevant and regional, lessons 2 and 3 encourage personal solutions to real-world energy issues. 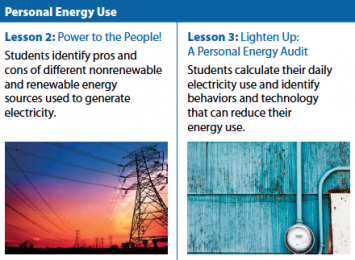 While important outcomes of energy education include knowing where one’s energy comes from, how much energy one uses, and the ability to accurately compare different energy sources, these ideas can be abstract and removed from students’ personal experience. The sheer size of the electric grid makes it difficult to hold an accurate mental picture of this infrastructure and, while most of us have lots of experience with electrical outlets, few of us have seen firsthand a hydroelectric turbine or a uranium mine. By making these energy concepts more relevant and regional, we empower students to engage in personal solutions to real-world energy issues. In lessons two and three, students find out their regional fuel mix and use nonfiction readings to reevaluate this fuel mix. A personal energy audit begins and ends with a questionnaire that addresses knowledge, attitudes, and behaviors related to electricity. Tasked with calculating how much electricity they use, students learn to read their utility bill and use the formula Energy = Power x time. In keeping with global sustainability pedagogy, these lessons seamlessly integrate core math, science, and social studies skills and create opportunities for student reflection on personal attitudes and behaviors about energy.While important outcomes of energy education include knowing where one’s energy comes from, how much energy one uses, and the ability to accurately compare different energy sources, these ideas can be abstract and removed from students’ personal experience. The sheer size of the electric grid makes it difficult to hold an accurate mental picture of this infrastructure and, while most of us have lots of experience with electrical outlets, few of us have seen firsthand a hydroelectric turbine or a uranium mine. Do you think that energy is a basic human right? Why or why not? 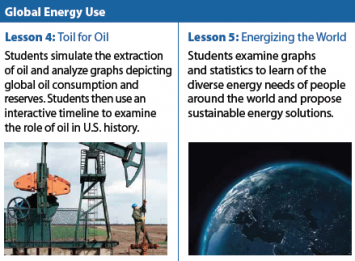 By using global statistics and energy profiles from four different countries, the next two lessons expand classroom discussions from personal energy use to global energy use. Students integrate information from a hands-on oil drilling simulation, graphs, and global statistics to develop understanding of petroleum as a global commodity. 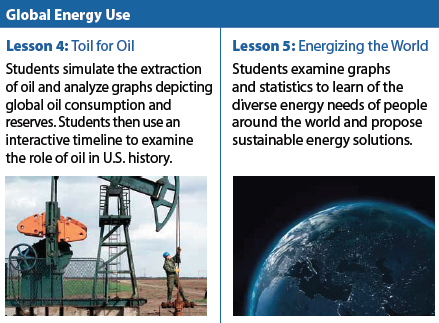 Figure 4: By using global energy statistics and profiles from different countries, lessons 4 and 5 expand class discussions from personal to global energy use. By using profiles from different countries, students learn that sustainable solutions to energy-related issues are much more diverse than energy conservation and efficiency. They learn that human energy use is inextricably linked to issues such as access, equity, and gender. By analyzing statistics, integrating information from various sources, and communicating with peers, students gain a more comprehensive understanding of the interconnected nature of global energy issues, and build global awareness. Why is it important to have many different stakeholders influence policy on biofuels? The last four lessons in Fueling Our Future hone in on transportation fuels and invite students to use what they have learned in the previous five lessons to evaluate the sustainability of alternative transportation fuels. These lessons are highly collaborative and require students to take multiple perspectives on energy-related issues. Lesson six explicitly teaches students the concept of sustainability and how to use the three components of sustainability to evaluate complex global issues. The sustainability Venn diagram is used as a tool to help students attend to the social, economic, and environmental components of a complex issue such as energy. 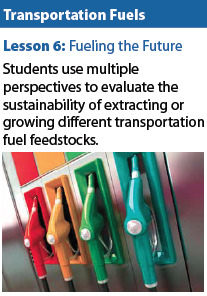 Figure 5: Students use multiple perspectives to evaluate the sustainability of different transportation fuels in lesson 6. Lesson six also uses a role playing activity to help students better understand issues associated with biofuels. Individuals take on the role of a professional, such as an ethanol plant worker or a marine biologist, and then small groups discuss and evaluate the sustainability of this fuel from social, economic, and environmental perspectives. With high levels of scaffolding within this lesson, students are able to engage in a sophisticated evaluation of transportation fuels and gain a more comprehensive and authentic understanding of transportation fuels. A PBA focused on the timely and relevant issue of biofuels can be an engaging way for students to develop the skills needed to become energy-literate citizens. During this particular PBA, students work independently and collaboratively to answer the driving question: What are the most sustainable biofuels that can be produced in the Pacific Northwest for aviation? This question challenges students to apply systems thinking to assess the entire supply chain of fuel rather than just the feedstock or the finished product. Students also learn about stakeholders associated with biofuels and learn active listening and negotiation techniques to use during a classroom stakeholder meeting. Upon completion of the PBA, individuals are asked to reflect on their collaboration, communication, and critical thinking skills and to write a personal position paper on biofuels in the Pacific Northwest. If we want our students to be able to take on complex, real-world energy problems, then we need to teach them to do so. This focused, context-specific driving question allows students to answer the question with genuine and thoughtful answers. It drives home the point that sustainable solutions are not necessarily one-size-fits-all; in fact, a feedstock sustainably grown in one locale may not be sustainably grown elsewhere.A PBA focused on the timely and relevant issue of biofuels can be an engaging way for students to develop the skills needed to become energy-literate citizens. During this particular PBA, students work independently and collaboratively to answer the driving question: What are the most sustainable biofuels that can be produced in the Pacific Northwest for aviation? This question challenges students to apply systems thinking to assess the entire supply chain of fuel rather than just the feedstock or the finished product. Students also learn about stakeholders associated with biofuels and learn active listening and negotiation techniques to use during a classroom stakeholder meeting. Upon completion of the PBA, individuals are asked to reflect on their collaboration, communication, and critical thinking skills and to write a personal position paper on biofuels in the Pacific Northwest. Just as we ask students to take on multiple perspectives and actively apply the 4 Cs (critical thinking, communication, collaboration, and creativity), we ask this of our curriculum development process. FTF lessons are reviewed by educational experts, content experts, and the FTF Teacher Advisory Group. Teachers in different subject areas from around the world pilot lessons in their classrooms and provide feedback. This invaluable input is used to revise, redesign, and enhance our curriculum. As noted earlier, Fueling Our Future was developed in partnership with NARA. Because this alliance includes people from many different fields who are working together to solve a real-world problem of energy, it inspired engaging, interdisciplinary lessons and provided a community of experts who were able to provide feedback. NARA partners who are assessing the sustainability of this real-world biofuel supply chain and partners working with tribal members took the time to review lessons. The staff and graduate students at University of Idaho’s McCall Outdoor Science School (MOSS) helped to brainstorm lesson ideas, review lessons, pilot lessons with students, and provided feedback from an informal science education perspective. As such, the collaborative nature of GSE is illustrated in this partnership with NARA. Since Fueling Our Future’s publication in 2014, over 270 units have been purchased and accessed by educators in eleven different countries. The next steps in our curriculum development process are to further evaluate this resource using an energy literacy assessment tool developed by the NARA education team, and to develop an elementary curriculum. As human energy use is complex and interdisciplinary in nature, so too should be our efforts in energy education. 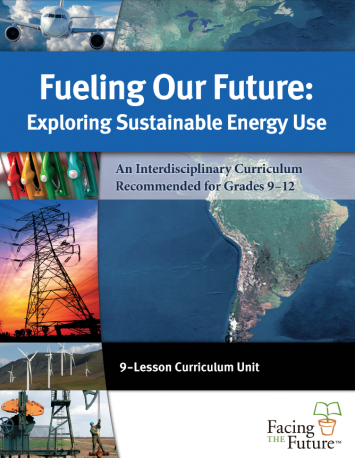 As shown in Facing the Future’s curriculum, Fueling Our Future: Exploring Sustainable Energy Use, global sustainability is an authentic, interdisciplinary context for teaching students about the complexities of energy, addressing the social, economic, and environmental components of human energy use, and preparing students to be energy literate citizens. Beyond energy education, the global sustainability framework provides an engaging and empowering opportunity for students to learn about other contemporary issues while gaining the knowledge and skills needed to respond effectively to 21st century challenges. While FTF’s educational approach is unique, we are not alone in our efforts. Major global efforts are underway to integrate sustainability into K-12 and higher education. Going forward, it is clear that educating to achieve sustainable development around the world—what it means, how we achieve it, and why it matters—will continue to be a major theme in education, commerce, and governance. This work, as part of the Northwest Advanced Renewables Alliance (NARA), was supported by the Agriculture and Food Research Initiative Competitive Grant no. 2011-68005-30416 from the USDA National Institute of Food and Agriculture. D. Hendrickson, D. Shaw, S. Jacob, A. Keefe, & L. Skelton, Fueling our Future: Exploring Sustainable Energy Use, Middle School ed., (Seattle: Facing the Future, 2014), www.facingthefuture.org; D . Hendrickson, D. Shaw, S. Jacob, A. Keefe, & L. Skelton, Fueling our Future: Exploring Sustainable Energy Use, High School ed., (Seattle: Facing the Future, 2014), www.facingthefuture.org; D. Hendrickson, D. Shaw, S. Jacob, A. Keefe, & L. Skelton, Fueling our Future: Exploring Sustainable Energy Use, SMART Board ed., (Seattle: Facing the Future, 2014), www.facingthefuture.org; This project is part of the Northwest Advanced Renewables Alliance (NARA), supported by the Agriculture and Food Research Initiative Competitive Grant no. 2011-68005-304 from the USDA National Institute of Food and Agriculture. “Educator Testimonials,” Facing the Future, under Curricula & Free Units, accessed October 14, 2014 www.facingthefuture.org/Curriculum/Testimonials/tabid/148/Default.aspx. United Nations Educational, Scientific, and Cultural Organization (UNESCO), Education for Sustainable Development Sourcebook, Education for Sustainable Development in Action: Learning and Training Tools, (UNESCO: Paris, France, 2012), http://unesdoc.unesco.org/images/0021/002163/216383e.pdf. NGSS Lead States, Next Generation Science Standards: For States, By States, (Achieve, Inc. on behalf of the twenty-six states and partners that collaborated on the NGSS, 2013), www.nextgenscience.org/. J.E. DeWaters, S.E. Powers, and M. Graham, “Developing an Energy Literacy Scale,” In Proceedings of the 114th Annual ASEE Conference & Exposition, Honolulu, HI, June 2007, paper number AC 2007-1069, www.clarkson.edu/cses/research/pdf4.pdf. US Department of Energy, Energy Literacy: Essential Principles and Fundamental Concepts for Energy Education, (Washington, DC: March 2012), http://energy.gov/eere/education/energy-literacy-essential-principles-and-fundamental-concepts-energy-education. Northwest Advanced Renewables Alliance (NARA) website, accessed September 9, 2014, www.nararenewables.org/. K. Michael Hibbard et al., “What is Performance-Based Learning and Assessment, and Why is it important?,” in A Teacher’s Guide to Performance-Based Learning and Assessment, (Middlebury, CT: Educators in Pomperaug Regional District 15, 1996), accessed www.ascd.org/publications/books/196021/chapters/What_is_Performance-Based_Learning_and_Assessment,_and_Why_is_it_Important%C2%A2.aspx.